I finally (finally!) picked up a copy of the new issue of Family Circle Easy Crochet (Fall/Winter 2005). I’d been meaning to stop by and check for it at Books-A-Million but never quite made it. In a stroke of lucky convenience, I found it while grocery shopping at Harris Teeter a couple of days ago. I felt a tad gulity snapping up their last two copies, so I hope they restock it. I am elated, moved, and proud to see Crochetville mentioned (page 10) in their four-page spread called get hooked: what’s new, what’s next, what’s hot. Thank you, thank you, thank you to all C’ville members; it wouldn’t be a community without you. And many thanks also to my co-admins and mods who help keep the place running smoothly. There’s plenty of good company on those pages, including some Crochetville members: Crochet me, NexStitch, and Brain’s Barn. As for the mag itself? I haven’t yet taken the time to read the patterns in detail, but I love the way they present crochet. Modern, fun, and for everybody. No over-coiffed blonde models who’ve been told to look as vacuous as possible. And the fact that this good mag is put out by Family Circle–mainstream enough for me to pick up a copy in the grocery store–is, without a doubt, good for crochet because it makes it more accessible. 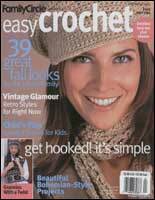 The next issue of Family Circle Easy Crochet (Spring/Summer 2006) is scheduled to be out on newsstands April 18, 2006. I love grocery store finds like that! I have yet to pick up a copy of this magazine. Im keeping my eyes peeled for it, though. Thats great that they took notice of ctochetville! I havent signed up for it yet, but I frequently read the posts. I also check out associatedcontent.com. If you look under ‘lifestyle’ on the site, youll find a crafts and hobby section. I always find something good to read there! Yay! Congratulations! Now that it’s Wednesday again — I’m told that’s the big Magazine Shipment Day — I’ll have to hunt around for a copy some more. congrats on the mention! that’s awesome. i haven’t been able to find a copy of that mag around here. i might have to see if my mom can find it back home, heh. Hey! 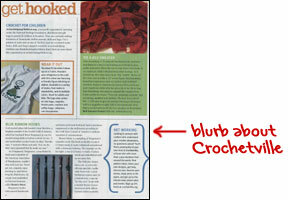 I have that magazine, and I totally missed the part where Crochetville was mentioned! I’ll go read it right now! YAY!! Congrats Donna. I do have a question on a pattern in the mag. Pg 72, Tote (felted) It’s basic & must have a memory lapse!! Instructions are: *work 16 sc along each short edge of bas & 44 sc along each long edge (no problem there) next ?? working both first & last st of each side in same st at corners????? Not dec or inc so what are they saying? Can anyone explain?